Life has become routine and we have started to work like a machine. There is no time to spend with our closed ones as well as to pamper ourselves. We need to understand how important is that to come out of casual lunch, fat parties and classy dance floors, but to get connected with our very own Mother Nature. Exploring nature and new places indeed acts as a great treatment to wipe out all your negativity; outing offers far more than just an opportunity to dust off the blanket and wicker basket. A long day out for a reunion with your gang and various getaways are to meet up with diverse people and thoughts. So, don’t wait too long, let’s ESCAPE from the terrible traffic, busy roads, hectic job to explore just not only the beauty of place but the inner you. Here we have come up with some amazing places to visit around Namma Bengaluru. The Anthargange hill is located just 70KM from Bangalore and also referred to as Dakshin Kashi or Kashi of the South. Lied in the vicinity of the Shathashrunga Mountain Range, the place meets the Eastern Ghats. Kasi Vishweshwara temple is one of the main attractions of Anthargange trek that has a sacred pond. It receives water from the perennial spring ‘Anthargange’ coming from the mouth of a Basava (bull carved in stone). Anthargange hills are a perfect spot for trekking, rock climbing, night navigation, exploring naturally carved caves and other adventure activities. There is a flight of 500+ broken stone steps to reach the temple, plus 7km route is through volcanic rocks. The hill of Savandurga lies in Magadi, hardly a 60-kms journey from Bangalore. Being 1226 meters above sea level in Deccan plateau, it is believed to be one of the biggest monolith hills of Asia. It is formed by two hills, the black hill or Karigudda and white hill or Biligudda. There is a temple located in the foothill. Savandurga trek trail is an adventurous and an enjoyable paradise with the picturesque view for trek lovers relishing the rock climbing, cave exploration and rock inscriptions. The place exhibits an untouched beauty with no commercialized buildings or cafes whatsoever. Trekking uphill leads to a fortress built by the king Kempe Gowda. Savandurga trek also offers wildlife spotting of many butterfly species and birds including endangered yellow-throated bulbuls. The Manchinabele day adventure trip can generate the illustrious moments of magnificent memories for any family or friend having a get-together. The Manchinabele Dam, surrounded by deciduous forests and rocky hills, is another ideal spot for many planned adventures like trekking, swimming and rock climbing. The place is located just 50 Kms from Bangalore on the bank of the river Arkavathi. The silent backwaters coming from a huge water reservoir may sentimentalize you with a fresh breeze and beautiful hillocks. The Manchinabele day adventure provides a plain landscape to put up tents, set a campfire and watch the beautiful sceneries. Ramanagara is the land of seven hills named as Yatirajagiri, Shivaramagiri, Somagiri, Revannasiddeshwara Betta, Krishnagiri, Sidilakallu Betta and Jalasiddeshawara Betta. The Bollywood movie – Sholay was not the only one which has rendered the beauty of this rocky hillock. Earlier, David Lean uses the Ramanagara hills in his film A Passage to India. The hilly landscape and the wide open spaces of relatively unharmed nature make Ramanagara a beautiful escape from the hustle and bustle of the city. The landscape of the region is beautiful, covered with numerous hills and lush greenery. As the place is renowned for the world’s oldest deposits of granite and other rock outcrops, the adventure sports like rock climbing, rappelling, cycling and trekking have its own thrill. The other places to visit during your Ramanagara trek trip are Janapada Loka (art gallery), highway cafes, Kanva water reservoir. Kunti Betta’s enchanted hills are covered by coconut trees, sugarcane and paddy fields. Located in the Pandavapura town just 130 kms from Bangalore, the place offers all kinds of adventure from trekking, rock climbing and rappelling to water sports like kayaking, coracle ride and river crossing. The trekking path here often gets steeper as you move upward but with some splendid views of the surrounding areas. Get onboard with Kunti Betta night trek team and you can get the best sunrise viewpoint, a panoramic view of tiny villages and the Thonnur Lake. This is a perfect place to spend a night out sitting near a campfire and having a meal under the moonlit sky. A scenic peak, a Hindu pilgrimage center, steep hillocks and the best sunrise/sunset point: Shivagange Betta has everything what any trek enthusiasts usually look for. This mountain peak stands at a height of 804.8 meters named as Dakshina Kashi where all the participants of Shivagange Night Trek troop may have a peaceful time, under the stars. Some of the major attractions of this place are the rock-cut statue of Nandi (Basava), theerthas (sacred ponds), Shanthala point and Patalagange. Here in Shivagange night trek, you can indulge in many adventure activities such as rock climbing, rappelling, etc. Also known as Kalavara Durga, Skandagiri is a mountain fortress located about 60 km from Banglore. The place is situated 3 km from Chikballapur village and comprises the ruins of a fort which dates back to the 18th century. The fort is in a dilapidated condition, and so is the temple situated close to it. 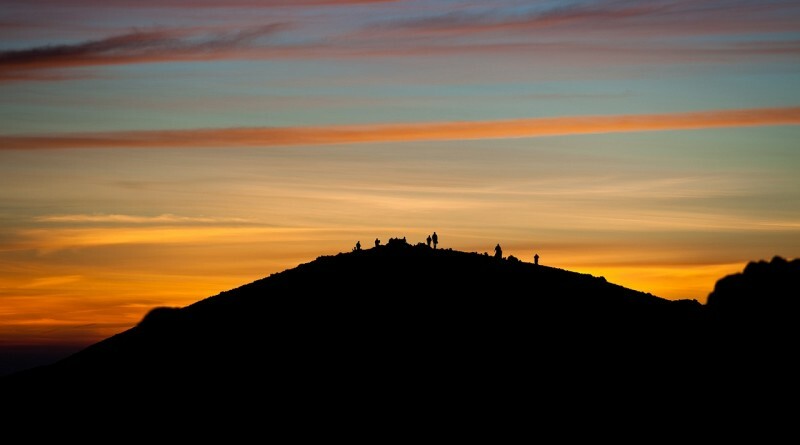 Skandagiri Hills offers the best night trek to the top of the hill which takes about 2 hours. This steep and fantastic trek through a maze of the dense shrub is highly intriguing. The major attractions are Papagni Temple situated at the foothills of Kalvara village and the fortress of Kalvara betta. On top of the hill, you see multiple rings of stonewalls protecting an abandoned temple on the hilltop. 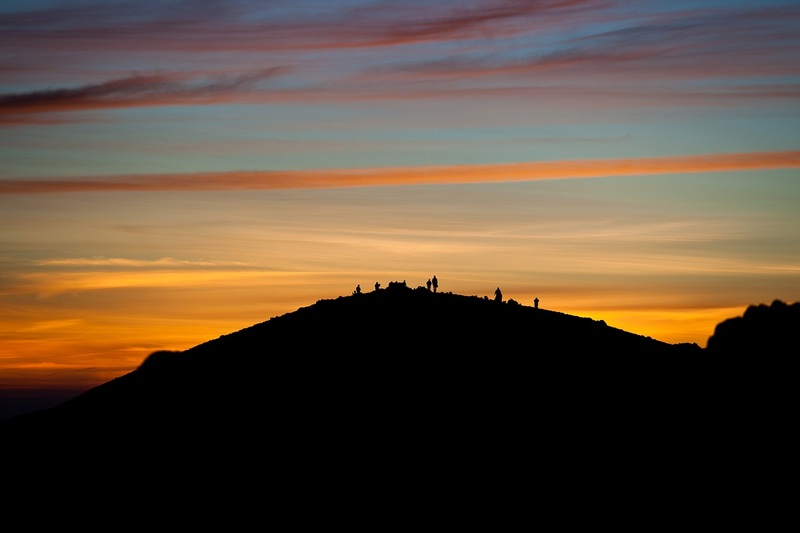 The peak of this mountain is one of many reasons for any trekker to pursue Skandagiri sunrise trek. Skandagiri Hills, close to the Nandi Hills, features a beautiful night trek, altitude camping, stunning sunrise, and serene and ocean-like clouds. If you are planning for Kanakapura one day outing then Just 3 kms from Kanakpura town, Bananthimari Betta Hills can be your destination to witness the astonishing view of a lush green valley and a stream flowing in it. The trek path is surrounded by two hillocks and begins at the Bananthimari temple. The peak is a flat rock surface with stunned scrubs; climbing here requires some courage. During their Kanakapura Day outing, hikers can witness bird view of water bodies, paddy fields, the natural picture frame for photographers and jaw-dropping surroundings. Apart from it, they can also spot some small mammals and reptiles. Hogenakkal Falls is called the Niagra of India, not literally though. Descending to the Cauvery River, the waterfall lures all excursionists for pleasant and jolting coracle ride with the magnificent view. The word Hogenakkal means Rocky Smoke what can be in the form of the mist created by the water hitting the rocks. What makes Hogenakkal Falls camping memorable is its deafening sound at the backdrop of a panoramic lush green forest canopy. The monsoon will be the best time to visit the falls. One side of the waterfall has Melagiri Hills which is covered with green vegetation in monsoons. If you are into water sports, this place has enough in its boat from coracle to kayaking, rafting and swimming. 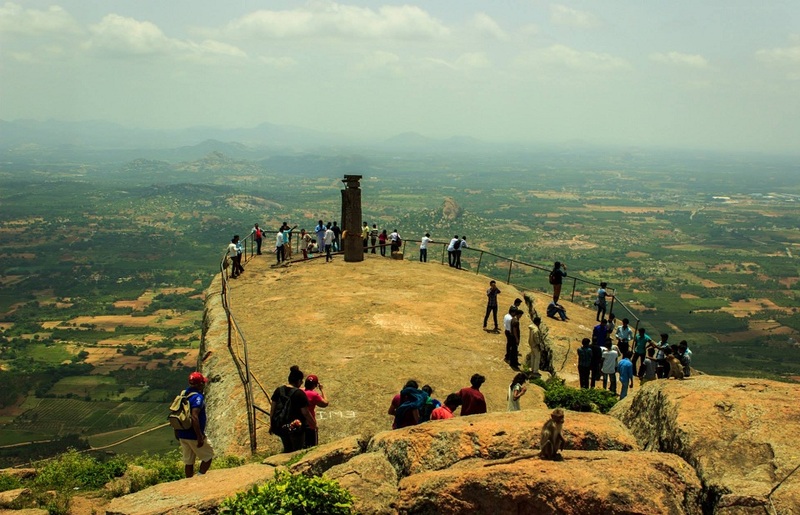 Madhugiri is renowned for its old forts and temples. Located in Tumkur district, the place incorporates the second largest monolith in Asia where any trekker would love to spend time and watch the splendid world on their foot. Many visitors often take a roll on the Madhugiri night trek just to watch the astonishing sunrise from the top of the monolith. Madhugiri fort, which is famous for its architecture and stone carving, was built by the Vijayanagar Dynasty. With watch towers and circular granaries around, the fort is the tourist place everyone must visit once in their lifetime. As a trekker, one must climb the steep slope and cross through the series of gates and stone carved walls. You will be extracting the knowledge of ancient architectures, war secrets, techniques and weapons used by the rulers. But the real gem of a beauty you will find at the top – the sunrise amidst mountains which is the culmination of the Madhugiri night trek. Plan your weekend with Escape2Explore to experience the perfect mix of beautiful, historic, culturally rich, heritage legacy, adventurous, awestruck places. Our well-trained team will lead your way in all the treks guiding you technically as well as informing you about the history of certain places. The blog is written by a talented and enthusiastic writer Chaitra Gowda.